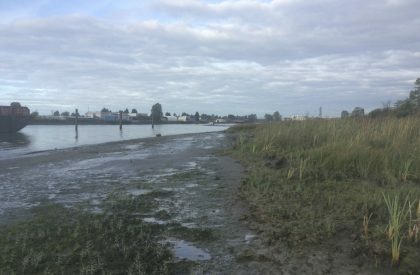 In 2015 the Community Mapping Network, in partnerships with the BC Conservation Foundation received funding from Environment Canada’s National Wetland Conservation Fund to survey the habitat of compensation sites in the Lower Fraser River Estuary. The last of two reports from that project is a “Guide for Managers and Practitioners” (linked above) which is based on the findings of the first 2016 full data report described below. The “Guide for Managers and Practitioners” is designed to help improve the state of habitat compensation in the Fraser River Estuary by making sound, evidence-based recommendations guided by the findings of Lievesley and Stewart (2016), “Assessing Wetland Compensation and Examining Limitation to Native Plant Establishment in the Lower Fraser River Estuary”. 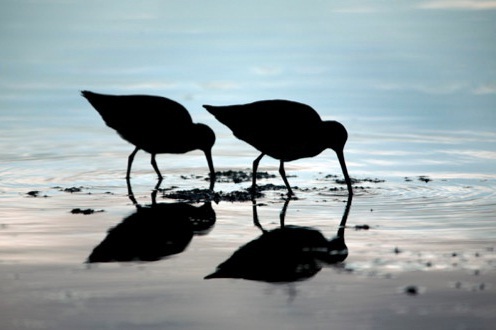 This project found that only one-third of sampled marsh habitat compensation projects created between 1983 and 2010 are acceptably compensating for habitat losses; and that several riparian habitat compensation projects from this same time period had significant deficiencies. These findings indicate many habitat compensation sites in the Fraser River Estuary need to be restored and managed for the future. It also indicates an improved approach is needed for new compensation work and for “habitat banking”. Links to the full data report of the 2015 field work “Assessing Habitat Compensation 2016” and appendices can be found below in the Atlas Documents section. From July-October 2015, the study surveyed 54 marsh and 19 riparian habitat compensation sites constructed within the Fraser River Estuary Management Plan (FREMP) framework from 1983-2011. There are approximately 110 compensation sites in the study area. We found only 1/3 of the sites surveyed achieved a No-Net-Loss target as required by Fisheries and Oceans policy. This represents a significant failure to compensate for habitat destroyed for land use development in the lower Fraser River and the Fraser estuary. All of the monitoring and assessment data is available on this atlas (linked above). Turn on the 2015 Field Data in the Legend and navigate through sites on the map. Or click on “2015 Field Data” in the bar above the map to view sites in list view. Each site contains a detailed site description, summary statistics from field survey, compensation success ranking, and raw vegetation survey data. Burrard Inlet Environmental Action Program (BIEAP) and Fraser River Estuary Management Program (FREMP) were two inter-governmental partnerships established to coordinate the environmental management of two significant aquatic ecosystems in the Lower Mainland of British Columbia – Burrard Inlet and the Fraser River Estuary. BIEAP and FREMP functioned through a Memoranda of Understanding which establish the framework for the coordination of partner agencies. Since 1996, the two partnership programs have been jointly administered from an office located in Burnaby, British Columbia. On March 31, 2013 the BIEAP-FREMP office, located in Burnaby, was closed. The FREMP-BIEAP Habitat Atlas will continue to be available to the public to view the current habitat information, shoreline colour coding and shoreline videos on the Community Mapping Network into the future independent of the administrative changes at the inter-governmental level. Intertidal shorelines that include near-shore riparian areas within the Fraser River estuary are colour-coded using a habitat classification system based on relative values of habitat features. Examples of habitat features include mudflat, marsh, and bottom land forest. The classification system is based on an inventory of all habitat types in the estuary. Estuarine shorelines are very dynamic areas where habitat features can change over time. These changes require periodic inspection of the habitat classification to ensure it is correct and remains useful. The classification is intended to guide prospective developers in selecting appropriate sites and to identify suitable design concepts prior to making application for project approval. Such approvals are obtained through application to relevant governmental authorities. The first habitat classification was conducted in 1988 and was based on coarse habitat inventory and paper based maps. Since 1988, the classification system was modified to incorporate an ecological features and functions approach. Subsequent field updates were undertaken in 2003, 2005, 2007 and 2008. The updated habitat classification is used on a regular basis for project reviews and is available on an interactive mapping application on the Community Mapping Network (CMN) at fremp-bieap-habitatatlas. The mapping application has been available for public consumption for over a decade and is actively used by environmental consultants to assist in development and restoration queries including recent queries by Fortis, BC. The BIEAP-FREMP management committee requested the province of BC, Fisheries and Oceans Canada and Environment Canada to provide possible updates to the FREMP classification including potential changes associated with habitat compensation sites. The Vancouver Fraser Port Authority (VFPA) compiled a list of the recommended sites. These included segments of the river where the shoreline shape had changed or eroded, where the colour coding was inaccurate (for example where it was currently green-coded but habitat compensation exists, or where currently it was red-coded but the bank was simply riprap), and any habitat compensation sites that were constructed since the last colour coding update in 2004-2005. The VFPA coordinated a two day field reconnaissance assessment June 28th and June 30th, 2016 to determine if updates to the habitat classification were necessary and to update the classification where it was needed. Field reconnaissance was undertaken using a VFPA patrol vessel. New habitat compensation sites and sections of the river that had changed since the previous boat reconnaissance were visited. The classification of each site was discussed during the site visit and the appropriate colour coding update was decided by consensus. The site visits allowed the agency partners to inspect the shoreline and discuss proposed coding changes, take photos where needed, and record the rationale for coding changes. The total number of sites visited in 2016 was 29 . Most of the updates were a result of the presence of compensation sites. The classification for a shoreline segment adjacent to a compensation site was updated to red. Other updates included red coding for segments associated with species at risk and high value habitat areas such as Deas Island Park and Sapperton Islands. Two updates to the shoreline were also necessary due to the removal of a cannery structure and the incorrect interpretation of an inlet that didn’t exist. All updates to the FREMP colour coding for 2016 can easily be found by searching for all 2016 records. In total, there were 41 records in the database that were either updated or added. Shorelines that include intertidal and near-shore riparian areas within FREMP have been classified and colour-coded on the basis of the relative values of their habitat features. Examples of habitat features include mudflat, marsh, and bottomland forest. The classification system is based on an inventory of all habitat types in the estuary. The codes are intended to guide prospective developers in selecting appropriate sites and identifying suitable design concepts prior to making application for approval of their projects. Such approvals are obtained through application to the appropriate Lead Agency and subsequent review through the Vancouver Fraser Port Authority. In 2003, the FREMP habitat inventory was updated using a “features and functions” approach to capture more information on upland structures and zoning, and lead to more objective determinations of habitat classifications. Red coded habitats include productive and diverse habitat features that support critical fish and wildlife functions on-site or as part of a more regional context and/or areas where habitat compensation has been previously constructed to offset habitat losses. Development in red coded areas is restrictive but may occur provided that mitigation is applied through site location and/or design to avoid impacts on habitat features and functions of the area. Habitat compensation is not an option as a rule. The only circumstances whereby exception to the above guideline can be considered are where the project is specifically undertaken in the interest of public health and safety. Even in these cases alternative siting and design mitigation must be pursued to the maximum extent possible. Yellow coded habitats include habitat features that are of moderate value in structure or diversity due to existing conditions (e.g. surrounding land uses or productivity) and support moderate fish and wildlife functions. Development may occur in yellow coded areas provided that mitigation and/or compensation measures are incorporated into the project design to ensure that there is No Net Loss, and where possible a Net Gain, of productive capacity as a result of the project. Mitigation options must be pursued to the maximum extent possible prior to consideration of compensation for unavoidable impacts to habitat features and functions. Habitat Green coded habitats include areas where habitat features and functions are limited due to existing conditions (e.g., developed for port or other urbanized uses). Development may occur in green coded areas provided that environmental impacts are mitigated through appropriate location, scheduling, design and operation and No Net Loss, and where possible a Net Gain, in the productive capacity of the site is achieved. "It is the absolute pleasure of BIEAP and FREMP to recommend the content and services of the Community Mapping Network. CMN has hosted data of our programs for more than 5 years and provided an important source of information for our partners and the public alike. In particular, the hosting of our Program’s habitat mapping and inventory has provided a vital referral point for many requiring this information in order to conduct business along the shoreline of the lower Fraser River and Burrard Inlet. Coordinated Project Review is a process whereby applications for shoreline development are reviewed by reviewing agencies prior to receiving approval. Due to the presence of productive fish habitat, certain areas of the lower Fraser cannot be developed. These areas have been mapped and a colour coding applied. This information is available via the FREMP Atlas on CMN. It has become standard practice of would-be developers to check the FREMP Atlas on CMN to determine how a location is colour-coded when making project review application. As with all maps of the landscape in a dynamic environment, changes occur out there which require regular updating in the virtual landscape. The amazing staff of CMN have always gone above and beyond when the need for a change is highlighted or when a problem has been reported. Their prompt attention to reported problems or glitches of any kind are what makes this such a high-integrity resource to the community.